My name is Emily Jameson. I am the artist here at Babies By Emily. I sculpt original lifelike baby dolls from polymer clay and produce my work as vinyl dolls kits for the reborn artist and limited edition dolls for the collector. I was born in 1990 and grew up in the Kansas City area. Growing up, I was encouraged to experiment with many different art forms and found that I was blessed to have been given a talent that I enjoy. I loved to try my hand at any new project that I saw; painting, drawing, pottery, crocheting, beading, photography, and more. After discovering the art of reborning in 2003, I was inspired to try it for myself. It didn’t take long before I found other artists creating one-of-a-kind hand sculpted baby dolls. I was amazed by the level of realism the artists could produce and I knew I wanted to do just that. I was fortunate to be able to develop my talent by taking sculpture classes from a world renowned sculptor from China, Kwan Wu. Through his classes, my artwork greatly improved. Kwan Wu is now retired from teaching and I thank him for the time I was able to spend soaking up his knowledge. Since then I have continued to develop my talent and have been blessed with several awards for my dolls. I have branched out from sculpting one-of-a-kind dolls, to producing my work in vinyl, resin, and silicone. I am honored that my precious works of art have been reproduced by Ashton-Drake Galleries and featured in several doll magazines including Doll Reader and LifeLike Dolls Magazine. Occasionally I display my work in art galleries and doll shows, and I hope my babies will bring joy to all that see them. Babies inspire me because of their tiny innocence. I love to study real babies and my goal in sculpting is to create a very realistic piece of artwork, but yet with my own unique style. Sculpture is a very flexible form of art. Clay can be manipulated any way the artist imagines. That is why I love sculpting. I love the freedom to create a doll with exactly the look I want. It amazes me how a block of clay can turn into a doll right under an artist’s fingers. Dolls are a very unique form of art because they not only can be displayed as other artwork can, but they can also be played with, dressed, and cuddled. It is my dream that I can continue creating dolls for many more years. An OOAK (one of a kind) baby is made from scratch starting with a block of polymer clay and a ball of aluminum foil. The foil is the base armature, which is inside all the pieces (head, arms, and legs). The polymer (oven bake-able) clay is rolled into thin sheets and applied over the foil. The face is built up with more clay in balls and lumps. The clay is added, removed, and pressed until I am satisfied with the look. All my OOAKs are sculpted either from a specific picture of a baby, or combinations of pictures for the most realistic newborn look. I look at the head from all different angles and check the symmetry before curing the clay. Once the parts are cured, they are sanded smooth. At this point the clay parts might be sent directly to a manufacturer to be made into a vinyl or silicone doll or kit, if that is the intent for a particular sculpt. Another option is for me to finish the sculpt as an OOAK doll. Hair is hand applied either before or after the clay is cured depending on the specifics of the doll. Painting is a bit simpler on OOAK babies than on reborns because I risk the clay cracking the more times I put the parts in the oven to heat set the paints. Sculpted babies are weighted and attached to a cloth body similarly to reborns, although there is no need to weight the head or limbs because of the weight of the clay. OOAK babies are much more delicate than reborns, so extra care should be taken when handling them. The reborning process starts out with a play doll or an artist’s vinyl “kit”. The pieces are washed and dried before painting begins. Permanent, non-fading Genesis Heat Set oil paints are applied with a sponge to create a “mottled” newborn look. Veins, shading, eyebrows, and fingernails are also painted. Many different colors and shades of paint are used to achieve "depth." Painting is a lengthy process and can take many days to achieve a realistic effect. Rooting hair is done by using a needle to press mohair (goats’ hair) into the vinyl head. Rooting takes many days to complete properl. When rooting is finished, the hair is sealed from the inside of the hollow head to allow it to be wetted and brushed without coming out. If the baby is an awake sculpt, the high quality acrylic or glass eyes are inserted and sealed. Synthetic eyelashes may be applied or eyelashes may be rooted with mohair. The eyes, nose, lips, and nails are sealed with varnish to appear wet or shiny. A magnetic pacifier or hair bow is sometimes added. Next the baby is ready to be put together. The head, limbs, and bottom are weighted with a combination of poly pellets, steel shot, and/or glass beads depending on the desired weight. The limbs are then sealed before being attached to a stuffed cloth body with cable ties. Now the baby is done and can be dressed in real baby clothes! 6/15/10: I'm so proud to announce that my baby Kate has been nominated for a DOLLS Award of Excellence! The public will be able to vote for their favorite dolls online starting this Friday, June 18th, or by mail a soon as you receive your August issue of DOLLS Magazine! 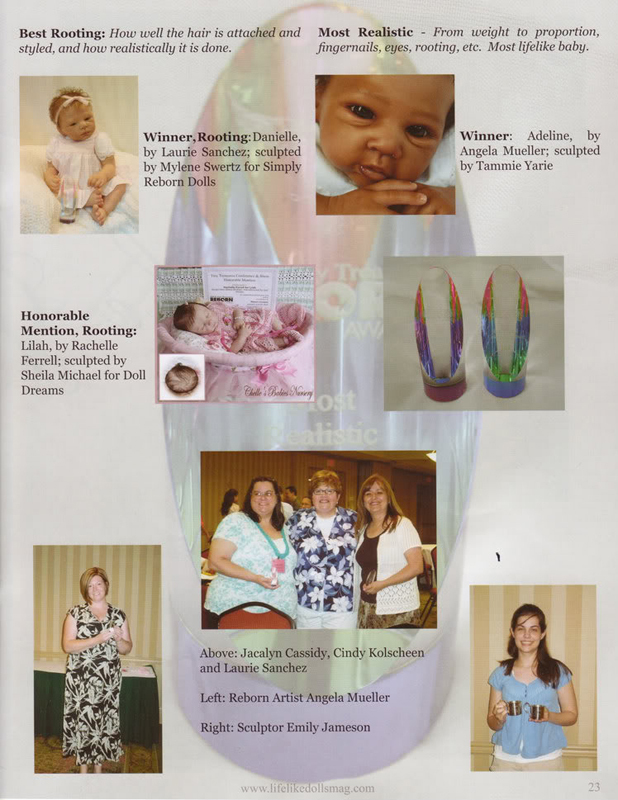 Kate was entered under the "One Of A Kind Baby Dolls $500 and Over" category. I hope you all will vote for her! Kate and her twin sister Klaire will be available in silicone very soon. I will be announcing the details later this week! 11-15-09: I am very excited to announce that I have signed a contract with Ashton-Drake Galleries and will be reproducing several dolls through them. My first doll through them is now available. Ashton Drake has made her into a doll named "With Faith All Is Possible"! This is the same baby as Miya who won the awards at the Tiny Treasure show in 2008. 8-28-08: I am happy to announce that my baby Miya and I are featured on pages 22 and 23 of the September/October issue of LifeLike Dolls Magazine as part of the article on the Tiny Treasures show! Here are the scanned images of those two pages. 7-1-08: I had a great time at the Tiny Treasures Doll Show last weekend! I enjoyed meeting so many people and looking at all the beautiful dolls. And I am very excited to announce that my baby Miya won two awards in the Tiny Treasures competition! 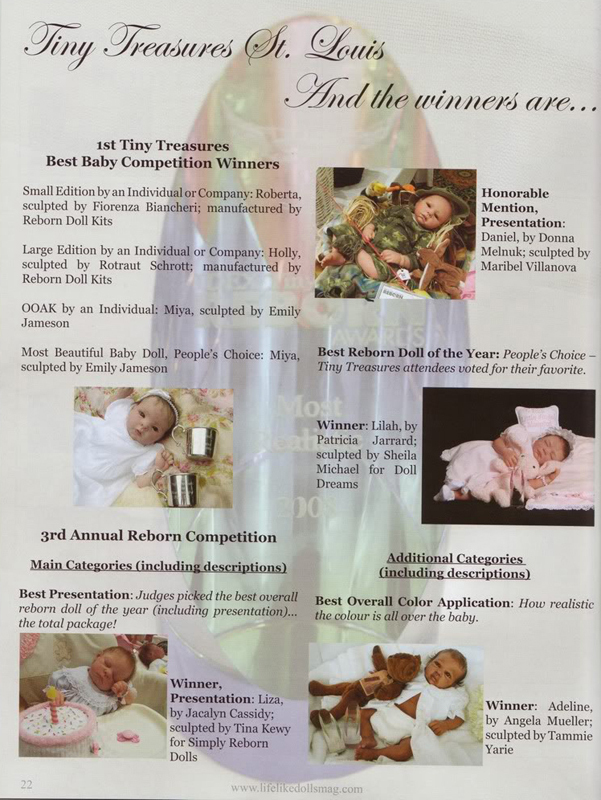 The two categories are OOAK Original by an Individual (judges' choice) and Most Beautiful Baby Doll (people's choice). Thanks to everyone who voted for me! I am still overwhelmed with the attention I am receiving from these awards! Here is baby Miya and her awards.